Our annual cycle has milestones – pruning, bud break, veraison, harvest – but none signal the end like pressing and racking the last reds in November. We call it “putting the reds to bed”, where they will lie quietly in the wine barn until spring, when they bubble again. 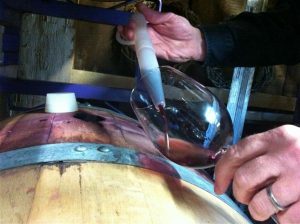 A secret in making fine red wine we learned from our first mentors, Lauren and Georgene Mortimer of Westfall Winery, near High Point, New Jersey. While interning there in 2005, our winemaker asked why they fermented their red wines outdoors under a tent when they had ample room in many outbuildings on their farm. “Dude, that’s how you get deep color, aroma and flavor”, Lauren replied. “Cool October temps up here slow fermentation to a crawl, but bring out the best without artificial extracts, additives and fake temperature control. Be patient, and don’t fear unless you hit 25oF”, meaning the ambient temperature when a fermentation will likely stall. The cooler it is, the longer it takes; the longer it takes, the better the wine. Today in the cold, windswept November rain – under a tent, of course – we pressed this year’s final bins and put the last reds to bed. The Cabernet Franc and Blaufränkisch have been fermenting for over three weeks, which is about 3x longer than most commercial wineries ferment theirs, and they are beautiful even in a challenging vintage like 2018. That’s where the color, aroma and flavor come from, Dude. Visit soon, the holidays are soon upon us and we want to see you. This entry was posted on November 6, 2018 by pleitner@mountsalemvineyards.com.